In some earlier post, you has been known how to convert your website mobile friendly with online services and common problems when creating a website for mobile devices. WordPress is a very popular PHP based Open Source blogging tool. By installing mobilizer plugins, your wordpress blog becomes mobile friendly, and all your earlier blog postings become ready to mobile-accessible with a minimum effort on your part. 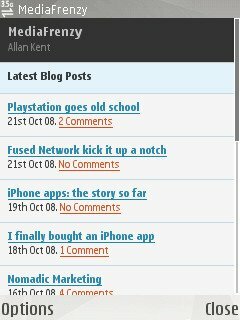 Below is amazing Plugins to view your WordPress Blog on any Mobile Device (iPhone, PDA…). It has mobile recognition, device adaptation and it is widget ready. With the mobile recognition and device adaptation feature, it automatically re-sizes the images, split the articles or post into multiple pages such that your web page looks just fine on any of the mobile phones. It has a mobile admin panel so the admin of the site can easily manage it. Mobile ad widget allows mobile ads or mobile Adsense to displayed on the mobile version of the web pages. MobilePress is a free WordPress plugin which turns your WordPress blog into a mobile friendly blog when viewed on a cell phone. MobilePress also allows you to create custom mobile themes for different handheld devices and mobile browsers such as the iPhone, Opera Mini and Windows Mobile. Wetomo (Web to Mobile) is a service that allows publishers to display their existing web content to users on mobile phones and other handheld devices. This plugin detects when a user is on a mobile phone and automatically redirects them to Wetomo, which acts a a proxy between the mobile phone and the WordPress site and adapts the web site content to the mobile phone capabilities. Mobile internet is irresistible. It is not only since Apple introduced its iPhone that people discover the pleasure of surfing the internet without being bound to their PC or Laptop. Unfortunately, many websites are not yet ready for visitors using mobile phones or other portable devices. This plugin detects mobile devices and sends them to the appropriate mobile URL. You must register for a free Mobify account in order to create and manage the mobile version. Are you frustrated with the way your site looks on mobile? Join top-tier WordPress publishers like SitePoint that are powering mobile versions of their websites with Mobify. Mobify is a web service that makes it possible to customize every component of the mobile look & feel, adapting it for over 5,000 devices. You can use this plugin to detect whether a visitor on your web site is using a web browser on a mobile device. The plugin allows you to create additional profiles of mobile device web browsers that are not included in the default configuration of the plugin. It is useful for setting up different stylesheets for different types of mobile browsers thereby allowing you customization for the device or mobile phone user. This article is the last in a series Make and convert any website that friendly Portable Devices, hope what I wrote useful for your work when build website mobile friendly. You can use the plugin also to detect if a visitor is in your web site even if you are using a browser from mobile phone. This is great. I just wrote an article for my blog about making sure that your site is mobile friendly. It is becoming more and more important that people can access your site while they are on the move. Thanks Narga, great post. Don’t worry about what pdair said, just keep on keeping on. Hi do you think which one is the best? Just ignore what pdair said – your English is great. Great post Narga. I saw a site called mobisitegalore.com where you can put together mobile sites as easy as 1 2 3. Great layouts too. Makes it real easy to make sites for off line clients. But you can’t do your own hosting and I don’t think you can save the files. Can wordpress make it that easy for non techie people? Great information about converting to mobile. Which one do you use on your website? It looks good on my iphone. You should consider writing a post where you explain all the plugins you use on your site. The WordPress plugins which I’ve mentioned on this post will be help you convert or make your wordpress website support mobile or handled device. I used it for more 6 months. This time, I’m not using it because my website layout is responsive, one layout for all devices and all screen sizes. Its based on Reverie WordPress Framework and Foundation CSS Framework. If you want to try, view my footer link. Oh, it is part of your theme framework. It looks good. Could you describe what plugins you are using for the static social sharing on each post? Also what is the email opt in popup? That looks good on the iphone as it takes up almost a third of the screen, but can be closed easily. I suspect the conversions are good. Which captcha plugin are you using? Lastly what is the “recommended for you” popup plugin on the bottom right corner? Thanks for your help making my site better.